This article is about the stage of the language. For the historical period, see Early Modern Britain. "Emode" redirects here. For the media company, see Tickle.com. Before and after the accession of James I to the English throne in 1603, the emerging English standard began to influence the spoken and written Middle Scots of Scotland. The grammatical and orthographical conventions of literary English in the late 16th century and in the 17th century are still very influential on Modern Standard English. Most modern readers of English can understand texts written in the late phase of the Early Modern English, such as the King James Bible and the works of William Shakespeare, and they have greatly influenced Modern English. Texts from the earlier phase of Middle English, such as the late-15th century Le Morte d'Arthur (1485) and the mid-16th century Gorboduc (1561), may present more difficulties but are still obviously closer to Modern English grammar, lexicon and phonology than are 14th-century Middle English texts, such as the works of Geoffrey Chaucer. The change from Middle English to Early Modern English was not just a matter of changes of vocabulary or pronunciation; a new era in the history of English was beginning. An era of linguistic change in a language with large variations in dialect was replaced by a new era of a more standardised language, with a richer lexicon and an established (and lasting) literature. 1476 – William Caxton starts printing in Westminster; however, the language that he uses reflects the variety of styles and dialects used by the authors who originally wrote the material. 1485 – Caxton publishes Thomas Malory's Le Morte d'Arthur, the first print bestseller in English. Malory's language, while archaic in some respects, is clearly Early Modern and is possibly a Yorkshire or Midlands dialect. 1491 or 1492 – Richard Pynson starts printing in London; his style tends to prefer Chancery Standard, the form of English used by the government. c. 1509 – Pynson becomes the King's official printer. From 1525 – Publication of William Tyndale's Bible translation, which was initially banned. 1539 – Publication of the Great Bible, the first officially-authorised Bible in English. Edited by Myles Coverdale, it is largely from the work of Tyndale. It is read to congregations regularly in churches, which familiarises much of the population of England with a standard form of the language. 1549 – Publication of the first Book of Common Prayer in English, under the supervision of Thomas Cranmer (revised 1552 and 1662), which standardises much of the wording of church services. Some have argued that since attendance at prayer book services was required by law for many years, the repetitive use of its language helped to standardise Modern English even more than the King James Bible (1611) did. 1557 – Publication of Tottel's Miscellany. 1582 – The Rheims and Douai Bible is completed, and the New Testament is released in Rheims, France, in 1582. It is the first complete English translation of the Bible that is officially sponsored and carried out by the Catholic Church (earlier translations into English, especially of the Psalms and Gospels existed as far back as the 9th century, but it is the first Catholic English translation of the full Bible). Though the Old Testament is ready complete, it is not published until 1609–1610, when it is released in two volumes. It does not make a large impact on the English language at large, it certainly plays a role in the development of English, especially in the world's heavily-Catholic English-speaking areas. c. 1590 to c. 1612 – Shakespeare's plays written. 1607 – The first successful permanent English colony in the New World, Jamestown, is established in Virginia. Early vocabulary specific to American English comes from indigenous languages (such as moose, racoon). 1611 – The King James Bible is published, largely based on Tyndale's translation. It remains the standard Bible in the Church of England for many years. 1630–1651 – William Bradford, Governor of Plymouth Colony, writes in his journal. It will become Of Plymouth Plantation, one of the earliest texts written in the American Colonies. 1647 – Publication of the first Beaumont and Fletcher folio. The English Civil War and the Interregnum were times of social and political upheaval and instability. The dates for Restoration literature are a matter of convention and differ markedly from genre to genre. In drama, the "Restoration" may last until 1700, but in poetry, it may last only until 1666, the annus mirabilis (year of wonders), and prose, it last until 1688, with the increasing tensions over succession and the corresponding rise in journalism and periodicals, or until 1700, when those periodicals grew more stabilised. 1651 – Publication of Leviathan by Thomas Hobbes. 1660–1669 – Samuel Pepys writes in his diary, which will become an important eyewitness account of the Restoration Era. 1662 – New edition of the Book of Common Prayer, largely based on the 1549 and subsequent editions, which long remains a standard work in English. 1667 – Publication of Paradise Lost by John Milton and of Annus Mirabilis by John Dryden. The 17th-century port towns and their forms of speech gain influence over the old county towns. From around the 1690s onwards, England experienced a new period of internal peace and relative stability, which encouraged the arts including literature. Modern English can be taken to have emerged fully by the beginning of the Georgian era in 1714, but English orthography remained somewhat fluid until the publication of Johnson's A Dictionary of the English Language, in 1755. 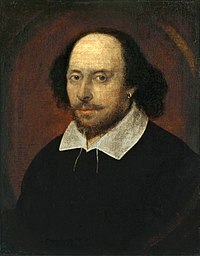 The towering importance of William Shakespeare over the other Elizabethan authors was the result of his reception during the 17th and the 18th centuries, which directly contributes to the development of Standard English. Shakespeare's plays are therefore still familiar and comprehensible 400 years after they were written, but the works of Geoffrey Chaucer and William Langland, which had been written only 200 years earlier, are considerably more difficult for the average modern reader. The orthography of Early Modern English was fairly similar to that of today, but spelling was unstable. Early Modern English, as well as Modern English, inherited orthographical conventions predating the Great Vowel Shift. Early Modern English spelling was similar to that of Middle English. Certain changes were made, however, sometimes for reasons of etymology (as with the silent ⟨b⟩ that was added to words like debt, doubt and subtle). The letter ⟨S⟩ had two distinct lowercase forms: ⟨s⟩ (short s), as is still used today, and ⟨ſ⟩ (long s). The short s was always used at the end of a word and often elsewhere. The long s, if used, could appear anywhere except at the end of a word. The double lowercase S was written variously ⟨ſſ⟩, ⟨ſs⟩ or ⟨ß⟩ (the last ligature is still used in German ß). That is similar to the alternation between medial (σ) and final lower case sigma (ς) in Greek. ⟨u⟩ and ⟨v⟩ were then considered as not two distinct letters but as still different forms of the same letter. Typographically, ⟨v⟩ was frequent at the start of a word and ⟨u⟩ elsewhere: hence vnmoued (for modern unmoved) and loue (for love). The modern convention of using ⟨u⟩ for the vowel sound(s) and ⟨v⟩ for the consonant appears to have been introduced in the 1630s. Also, ⟨w⟩ was frequently represented by ⟨vv⟩. Similarly, ⟨i⟩ and ⟨j⟩ were also still considered not as two distinct letters, but as different forms of the same letter: hence ioy for joy and iust for just. Again, the custom of using ⟨i⟩ as a vowel and ⟨j⟩ as a consonant began in the 1630s. The letter ⟨þ⟩ (thorn) was still in use during the Early Modern English period but was increasingly limited to handwritten texts. In Early Modern English printing, ⟨þ⟩ was represented by the Latin ⟨Y⟩ (see Ye olde), which appeared similar to thorn in blackletter typeface ⟨𝖞⟩. Thorn had become nearly totally disused by the late Early Modern English period, the last vestiges of the letter being its ligatures, ye (thee), yt (that), yu (thou), which were still seen occasionally in the 1611 King James Bible and in Shakespeare's Folios. A silent ⟨e⟩ was often appended to words, as in ſpeake and cowarde. The last consonant was sometimes doubled when the ⟨e⟩ was added: hence manne (for man) and runne (for run). The sound /ʌ/ was often written ⟨o⟩ (as in son): hence ſommer, plombe (for modern summer, plumb). The final syllable of words like public was variously spelt but came to be standardised as -ick. The modern spellings with -ic did not come into use until the mid-18th century. Many spellings had still not been standardised, however. For example, he was spelled as both he and hee in the same sentence in Shakespeare's plays and elsewhere. Today's "silent" consonants found in the consonant clusters of such words as knot, gnat, sword were still fully pronounced up until the mid-to-late 16th century and thus presumably by Shakespeare, though they were fully reduced by the early 17th century. The digraph <ght>, in words like night, thought, and daughter, originally pronounced [xt] in much older English, was probably reduced to simply [t] (as it is today) or at least heavily reduced in sound to something like [ht], [çt], or [ft]. It seems likely that much variation existed for many of these words. The now-silent l of would and should may have persisted in being pronounced as late as 1700 in Britain and perhaps several decades longer in the British American colonies. The modern phoneme /ʒ/ was not documented as occurring until the second half of the 17th century. Likely, that phoneme in a word like vision was pronounced as /zi/ and in measure as /z/. listen). That means, for example, that wine and whine were still pronounced differently, unlike in most varieties of English today. Word-final ⟨ng⟩, as in sing, was still pronounced /ŋɡ/ until the late 16th century, when it began to coalesce into the usual modern pronunciation, [ŋ]. H-dropping at the start of words was common, as it still is in informal English throughout most of England. The following information primarily comes from studies of the Great Vowel Shift; see the related chart. listen), as in glide, rhyme, and eye, was [ɘi] and later [əi]. Early Modern rhymes indicate that [əi] was also the vowel that was used at the end of words like happy, melody and busy. listen), as in cab, trap and sad, was more or less the same as the phoneme represents today. listen) (as it still retains in the word pretty). listen) as in day, pay, and say. Depending upon the exact moment or dialect of Early Modern English, met was a potential homophone with mate; the same was true for even mat and mate. Such an open pronunciation remains in some dialects, notably in Scotland, Northern England, and perhaps Ireland. listen), as in bib, pin and thick, was more or less the same as the phoneme represents today. listen). The phoneme was probably just beginning the process of merging with the phoneme [ou], as in grow, know and mow, without yet achieving today's complete merger. The old pronunciation remains in some dialects, such as in Yorkshire and Scotland. listen), as in boy, choice and toy, is even less clear than other vowels. By the late-16th century, the similar but distinct phonemes /ɔɪ/, /ʊi/ and /əɪ/ all existed. By the late-17th century, only /ɔɪ/ remained. Because those phonemes were in such a state of flux during the whole Early Modern period (with evidence of rhyming occurring among them as well as with the precursor to /aɪ/), scholars often assume only the most neutral possibility for the pronunciation of /ɔɪ/ as well as its similar phonemes in Early Modern English: [əɪ] (which, if accurate, would constitute an early instance of the line–loin merger since /aɪ/ had not yet fully developed in English). listen) seem to have included blood, brood, doom, good and noon. /ɪʊ̯/ or /iu̯/ occurred in words spelled with ew or ue such as due and dew. In most dialects of Modern English, it became /juː/ and /uː/ by yod-dropping and so do, dew and due are now perfect homophones in most American pronunciations, but a distinction between the two phonemes remains in other versions of English. The r sound (the phoneme /r/) was probably always pronounced with following vowel sounds (more in the style of today's Western English, Norfolk, Northern English, Irish or Scottish accents, and less like today's typical London or Received Pronunciation). Furthermore, /ɛ/, /ɪ/ and /ʌ/ were not necessarily merged before /r/, as they are in most modern English dialects. The stressed modern phoneme /ɜːr/, when it is spelled ⟨er⟩, ⟨ear⟩ and perhaps ⟨or⟩ (as in clerk, earth, or divert), had a vowel sound with an a-like quality, perhaps about [ɐɹ] or [äɹ]. With the spelling ⟨or⟩, the sound may have been backed, more toward [ɒɹ] in words like worth and word. In some pronunciations, words like fair and fear, with the spellings ⟨air⟩ and ⟨ear⟩, rhymed with each other, and words with the spelling ⟨are⟩, such as prepare and compare, were sometimes pronounced with a more open vowel sound, like the verbs are and scar. See Great Vowel Shift § Later mergers for more information. Nature was pronounced approximately as [ˈnɛːtəɹ] and may have rhymed with letter or, early on, even latter. One may have merged to the sound of own, with both one and other using the era's long GOAT vowel, rather than today's STRUT vowels. Tongue merged to the sound of tong and rhymed with song. Beginning of the Epistle to the Hebrews in the 1611 King James Bible. God who at sundry times, and in divers manners, spake in times past unto the Fathers by the Prophets, Hath in these last dayes spoken unto us by his Sonne, whom he hath appointed heire of all things, by whom also he made the worlds, who being the brightnesse of his glory, and the expresse image of his person, and upholding all things by the word of his power, when hee had by himselfe purged our sinnes, sate down on ye right hand of the Maiestie on high, Being made so much better then the Angels, as hee hath by inheritance obtained a more excellent Name then they. Early Modern English had two second-person personal pronouns: thou, the informal singular pronoun, and ye, the plural (both formal and informal) pronoun and the formal singular pronoun. "Thou and "ye" were both common in the early-16th century (they can be seen, for example, in the disputes over Tyndale's translation of the Bible in the 1520s and the 1530s) but by 1650,"thou" seems old-fashioned or literary. It has effectively completely disappeared from Modern Standard English but is still in use in some situations. In many churches in the United Kingdom and the United States, primarily those that use the King James Bible, "thou" is still used to address God in prayer and is felt to denote reverence. "Thou" also remains in regular use in particular regional English dialects, but its pronunciation is often reduced to "tha". The translators of the King James Bible of the Bible (begun 1604 and published 1611, while Shakespeare was at the height of his popularity) had a particular reason for keeping the "thou/thee/thy/thine" forms that were slowly beginning to fall out of spoken use, as it enabled them to match the Hebrew and Ancient Greek distinction between second person singular ("thou") and plural ("ye"). It was not to denote reverence (in the King James Bible, God addresses individual people and even Satan as "thou") but only to denote the singular. Over the centuries, however, the very fact that "thou" was dropping out of normal use gave it a special aura and so it gradually came to be used to express reverence in hymns and in prayers. Like other personal pronouns, thou and ye have different forms dependent on their grammatical case; specifically, the objective form of thou is thee, its possessive forms are thy and thine, and its reflexive or emphatic form is thyself. The objective form of ye was you, its possessive forms are your and yours and its reflexive or emphatic forms are yourself and yourselves. My and thy become mine and thine before words beginning with a vowel or an h. More accurately, the older forms "mine" and "thine" had become "my" and "thy" before words beginning with a consonant other than h, and "mine" and "thine" were retained before words beginning with a vowel or an h, as in mine eyes or thine hand. ^ a b The genitives my, mine, thy, and thine are used as possessive adjectives before a noun, or as possessive pronouns without a noun. All four forms are used as possessive adjectives: mine and thine are used before nouns beginning in a vowel sound, or before nouns beginning in the letter h, which was usually silent (e.g. thine eyes and mine heart, which was pronounced as mine art) and my and thy before consonants (thy mother, my love). However, only mine and thine are used as possessive pronouns, as in it is thine and they were mine (not *they were my). ^ a b From the early Early Modern English period up until the 17th century, his was the possessive of the third-person neuter it as well as of the third-person masculine he. Genitive "it" appears once in the 1611 King James Bible (Leviticus 25:5) as groweth of it owne accord. The third-person singular present lost its alternate inflections: -(e)th became obsolete, and -s survived. (Both forms can be seen together in Shakespeare: "With her, that hateth thee and hates us all"). The plural present form became uninflected. Present plurals had been marked with -en and singulars with -th or -s (-th and -s survived the longest, especially with the singular use of is, hath and doth). Marked present plurals were rare throughout the Early Modern period and -en was probably used only as a stylistic affectation to indicate rural or old-fashioned speech. The second-person singular indicative was marked in both the present and past tenses with -st or -est (for example, in the past tense, walkedst or gav'st). Since the indicative past was not and still is not otherwise marked for person or number, the loss of thou made the past subjunctive indistinguishable from the indicative past for all verbs except to be. The modal auxiliaries cemented their distinctive syntactical characteristics during the Early Modern period. Thus, the use of modals without an infinitive became rare (as in "I must to Coventry"; "I'll none of that"). The use of modals' present participles to indicate aspect (as in "Maeyinge suffer no more the loue & deathe of Aurelio" from 1556), and of their preterite forms to indicate tense (as in "he follow'd Horace so very close, that of necessity he must fall with him") also became uncommon. Some verbs ceased to function as modals during the Early Modern period. The present form of must, mot, became obsolete. Dare also lost the syntactical characteristics of a modal auxiliary and evolved a new past form (dared), distinct from the modal durst. The perfect of the verbs had not yet been standardised to use only the auxiliary verb "to have". Some took as their auxiliary verb "to be", such as this example from the King James Bible: "But which of you... will say unto him... when he is come from the field, Go and sit down..." [Luke XVII:7]. The rules for the auxiliaries for different verbs were similar to those that are still observed in German and French (see unaccusative verb). The modern syntax used for the progressive aspect ("I am walking") became dominant by the end of the Early Modern period, but other forms were also common such as the prefix a- ("I am a-walking") and the infinitive paired with "do" ("I do walk"). Moreover, the to be + -ing verb form could be used to express a passive meaning without any additional markers: "The house is building" could mean "The house is being built". A number of words that are still in common use in Modern English have undergone semantic narrowing. The use of the verb "to suffer" in the sense of "to allow" survived into Early Modern English, as in the phrase "suffer the little children" of the King James Bible, but it has mostly been lost in Modern English. Also, this period reveals a curious case of one of the earliest Russian borrowings to English (which is historically a rare occasion itself, either research or sources are scarce), for example - at least as early as 1600, the word "steppe" (rus. степь), first appeared in English in William Shakespeare's comedy "A Midsummer Night's Dream". It is believed that this is a possible indirect borrowing via either German or French. ^ For example, Río-Rey, Carmen (2002-10-09). "Subject control and coreference in Early Modern English free adjuncts and absolutes". English Language and Linguistics. Cambridge University Press. 6 (2): 309–323. doi:10.1017/s1360674302000254. Retrieved 2009-03-12. ^ Cercignani, Fausto, Shakespeare's Works and Elizabethan Pronunciation, Oxford, Clarendon Press, 1981. ^ Burroughs, Jeremiah; Greenhill, William (1660). The Saints Happinesse. Introduction uses both happineſs and bleſſedneſs. ^ a b Salmon, V., (in) Lass, R. (ed. ), The Cambridge History of the English Language, Vol. III, CUP 2000, p. 39. ^ Fischer, A., Schneider, P., "The dramatick disappearance of the ⟨-ick⟩ spelling", in Text Types and Corpora, Gunter Narr Verlag, 2002, pp. 139ff. ^ a b See The History of English (online) as well as David Crystal's Original Pronunciation (online). ^ Stemmler, Theo. Die Entwicklung der englischen Haupttonvokale: eine Übersicht in Tabellenform [Trans: The development of the English primary-stressed-vowels: an overview in table form] (Göttingen: Vandenhoeck & Ruprecht, 1965). ^ a b c d e Crystal, David (2011). "Sounding out Shakespeare: Sonnet Rhymes in Original Pronunciation". In Vera Vasic (ed.) Jezik u Upotrebi: primenjena lingvsitikja u cast Ranku Bugarskom. Novi Sad and Belgrade: Philosophy faculties. P. 298-300. ^ Cercignani, Fausto (1981), Shakespeare's Works and Elizabethan Pronunciation, Oxford: Clarendon Press. ^ Barber, Charles Laurence (1997). Early modern English (second ed.). Edinburgh: Edinburgh University Press. pp. 108–116. ISBN 0-7486-0835-4. ^ Wells, John C. (1982). Accents of English. Cambridge: Cambridge University Press. p. 199. ISBN 0-521-22919-7. (vol. 1). ISBN 0-521-24224-X (vol. 2)., ISBN 0-521-24225-8 (vol. 3). ^ Crystal, David. "Sounding Out Shakespeare: Sonnet Rhymes in Original Pronunciation". In Vera Vasic (ed. ), Jezik u upotrebi: primenjena lingvistikja u cast Ranku Bugarskom [Language in use: applied linguistics in honour of Ranko Bugarski] (Novi Sad and Belgrade: Philosophy Faculties, 2011), 295-306300. p. 300. ^ Lass, Roger, ed. (1999). The Cambridge History of the English Language, Volume III. Cambridge: Cambridge. p. 163. ISBN 978-0-521-26476-1. ^ Lass, Roger, ed. (1999). The Cambridge History of the English Language, Volume III. Cambridge: Cambridge. pp. 165–66. ISBN 978-0-521-26476-1. ^ Charles Laurence Barber (1997). Early Modern English. Edinburgh University Press. p. 171. ISBN 978-0-7486-0835-5. ^ Charles Laurence Barber (1997). Early Modern English. Edinburgh University Press. p. 165. ISBN 978-0-7486-0835-5. ^ Charles Laurence Barber (1997). Early Modern English. Edinburgh University Press. p. 172. ISBN 978-0-7486-0835-5. ^ Lass, Roger, ed. (1999). The Cambridge History of the English Language, Volume III. Cambridge: Cambridge. pp. 231–35. ISBN 978-0-521-26476-1. ^ Lass, Roger, ed. (1999). The Cambridge History of the English Language, Volume III. Cambridge: Cambridge. p. 232. ISBN 978-0-521-26476-1. ^ Lass, Roger, ed. (1999). The Cambridge History of the English Language, Volume III. Cambridge: Cambridge. pp. 217–18. ISBN 978-0-521-26476-1.